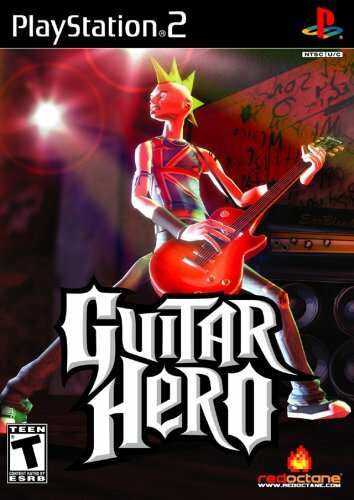 Guitar Hero is the first game in the series. It was released for PS2 and contained 47 songs. There are also 2 secret songs present on the game, which were eventually hacked. The songs are mostly covers, created by a team of musicians in the Boston area. The main setlist is made up of covers, but there were also 17 bonus songs, which were mainly by bands the musicians working on the covers were in, although some established artists were present here, notably 'Fire It Up' by Black Label Society, and the winners of the 'Be A Guitar Hero' contest, Graveyard BBQ, with the song 'Cheat on the Church.' The finally set list was finalized a remarkably short time before the shipping date - Fire It Up was included 2 weeks before, as Zakk Wylde contacted Harmonix about it. The game was the result of a collaboration between RedOctane and Harmonix to bring a new rhythm game to North America.